Before jumping into the design of a learning solution, it is important to understand the connection between the different types of learning theories with other aspects of the learning process such as learning styles and educational technologies. According to Ertmer and Newby (1993), “learning theories provide instructional designers with verified instructional strategies and techniques to facilitate learning as well as a foundation for intelligent strategy selection” (p.50). What is the role of memory? What types of learning are best explained by this theory? How is technology used for learning in your industry? Learning is accomplished when a proper response is demonstrated following the presentation of a specific environmental stimulus. In behaviorism learning occurs when there is a change in an observable performance. Behaviorism focuses on the importance of the consequences of the performances and contends that responses that are followed by reinforcement are more likely to reoccur in the future. The learner is characterized for being reactive to conditions in the environment as opposed to taking an active role in discovering the environment. Learning means changes in the probability of response. Arrangement of stimuli and consequences within the environment. Forgetting is attributed to the non-use of a response over time. The use of periodic practice or review serves to maintain a learner’s readiness to respond. Memory is hard wiring of repeated experiences where reward and punishment are most influential. Transfer is a result of generalization. Situations involving identical or similar features allow behavior to transfer across common elements. Learning is manifested by a change in behavior. The behaviorism strategies are more useful for building and strengthening stimulus-response associations, including the use of instructional cues, practice and reinforcement. Learning that involves discriminations (recalling facts), generalizations (defining and illustrating concepts), associations (applying explanations) and chanining (automatically performing a specified procedure). Skinner’s teaching machines and programmed texts. Computer-assisted instruction (CAI) and mastery learning. Teaching Machines: a mechanical device to automate the task of programmed instructions. Films: visual materials to help learners acquire, retain and transfer responses based on the ability of such materials to cue and reinforce specified responses and serve as examples. Programmed Instruction: programmed books essentially had the same characteristics as the teaching machines; logical presentations of content, requirement of overt responses and presentation of immediate knowledge of correctness (a correct answer would equal positive reinforcement. Linear Programming: Linear programming involves a series of learning frames presented in a set sequence. Instructional Design: specification of objectives (behavioral), concentration on behavioral changes in learners, the emphasis on the stimulus (environment) and task analysis. Through a mental activity that entails internal coding and structuring by the learner. Learning means discrete changes between the states of knowledge. The learner is viewed as a very active participant in the learning process. Cognitive theory addresses the issue of how information is received, organized, stored and retrieved by the mind. The approach is changing the learner by encouraging him/her to use appropriate learning strategies. Role of practice with corrective feedback. Learner’s thoughts, beliefs, attitudes and values. Prominent role. Learning occurs when information is stored in memory in an organized and meaningful manner. Forgetting is the inability to retrieve information from memory because interference, memory loss, or missing or inadequate cues needed to access information. Transfer is a function of how information is stored in memory, when a learner understands how to apply knowledge in different contexts, then transfer has occurred. For explaining complex forms of learning (reasoning, problem-solving, information-processing) than are those of a more behavioral perspective. Reasoning, clear objectives, problem solving. Some strategies are: concept mapping, mnemonics, framing, outlining and advanced organizers. By creating meaning from experience. Learners build personal interpretations of the world based on individual experiences and interactions. Environmental factors, the learner and the interaction between them. This is why content and knowledge should be embedded in the context or situation in which is going to be used. Constructivism contends that situations co-produce knowledge through activity. Memory is always under construction as a cumulative history of interactions. According to constructivism, a concept will continue to evolve with each new user as new situations, negotiations and activities are experienced by the learner. Constructivist emphasize the flexible use of the pre-existing knowledge rather than the recall of pre-packaged schemas. Transfer occurs by involvement of the learner in authentic tasks anchored in meaningful contexts. Constructivist view is that learning always takes place in a context and that context forms an inexorable link with the knowledge embedded in it. Constructivist learning environment is most effective for the advanced knowledge acquisition, where initial misconceptions and biases acquired previously can be discovered, negotiated and if necessary modified or removed. For complex and ill-structured problems. Some strategies are: situating tasks in real world contexts, use of cognitive apprenticeships, presentation of multiple perspectives, social negotiation, use of examples, reflective awareness and providing considerable guidance on the use of constructive processes. Technologies: wikis, blogs (collaborative learning to develop and share alternative views), debates, discussion, evidence-giving, community systems, blackboard, virtual chats, webinars. Other technologies: websites, PowerPoint presentations, online discussions, problem-solving situations, virtual tours, online libraries, databases, competitions, games, quizzes. Interaction/observation in social contexts. Interacting in a community of practice. An individual acquires knowledge through engagement in social activities. Knowledge acquisition is not a stand-alone entity, but is constructed over time through social engagement and ongoing discourses within cultural contexts and value systems. Social learning theories take social interactions into account, but still from a primarily psychological perspective. They place the emphasis on interpersonal relations involving imitation and modeling, and thus focus on the study of cognitive processes by which observation can become a source of learning. They are useful for understanding the detailed information-processing mechanisms by which social interactions affect behavior. Domain of knowledge: creates common ground and a sense of common identity. It also inspires members to contribute and participate, guides their learning and gives meaning to their actions. Community of people: creates the social fabric of learning, because it encourages a willingness to share ideas, expose one’s ignorance, ask difficult questions and listen carefully. Shared practice: is a set of frameworks, ideas, tools, information, styles, language, stories and documents that community members share. Learners are constructors of knowledge through observation. Memories are easier to recall if they are connected to a social interaction. People learn from one another, via observation, imitation and modeling. Inventive ways of engaging learners in meaningful practices, of providing access to resources that enhance their participation, of opening their horizons so they can put themselves on learning trajectories they can identify with, and of involving them in actions, discussions, and reflections that make a difference to the communities that they value. Using many social networks such as wikis, Skype, Facebook. Through forums, group activities, debates. It is at the intersection of prior knowledge, experience, perception, reality, comprehension and flexibility that learning occurs. Distributed within a network, social, technologically enhanced, recognizing and interpreting patterns. The theory of connectivism is the combined effect of three different components: chaos theory, networks, and the interplay of complexity and self-organization. Chaos Theory: the idea behind Chaos Theory is that, regardless of how unrelated events may seem, when studied together, they create a pattern that can show relevance beyond the individual events themselves. Networks: are connections between entities. By using these networks – of people, of technology, of social structures, of systems, of power grids, etc. – learning communities can share their ideas with others, thereby “cross-pollinating” the learning environment. Complexity and Self-Organization: a complex system is typically modeled as a collection of interacting agents, representing components as diverse as people, cells or molecules. Because of the non-linearity of the interactions, the overall system evolution is to an important degree unpredictable and uncontrollable. However, the system tends to self-organize, in the sense that local interactions eventually produce global coordination and synergy. Adaptive patterns, representative of current state existing in networks. Social media tools (Skype, Twitter, Facebook). Technology is used to build networks where knowledge can be accessed and built upon community members input. Learning is a process that lasts throughout the entire lifespan of most people. For optimum transfer of learning, the learner must be actively involved in the learning experience, not a passive recipient of information. Each learner must be responsible for his/her own learning. The learning process has an affective (emotional) as well as an intellectual component. Adults learn by doing; they want to be involved. Regardless of the benefits of coaching, one should never merely demonstrate how to do something if an adult learner actually can perform the task, even if it takes longer that way. Problems and examples must be realistic and relevant to the learners. Adults relate their learning to what they already know. It is wise to learn something about the backgrounds of the learners and to provide examples that they can understand in their own frames of reference. An informal environment works best. Trying to intimidate adults causes resentment and tension, and these inhibit learning. Variety stimulates. It is a good idea to try to appeal to all five of the learners’ senses, particularly to those aspects identified by neurolinguistics programming: the visual, the kinesthetic and the auditory. A change of pace and a variety of learning techniques help to mitigate boredom and fatigue. Learning flourishes in a win-win, non-judgmental environment. The norms of the training setting are violated by tests and grading procedures. Checking learning objectives is far more effective. Life experience (including life altering events that affect cognitive abilities). Work experience (including development of thinking patterns based on this experience). Positive/negative previous adult learning experiences. Elements affecting performance, including cognitive abilities. Biological changes take place as individuals age, and it has been shown that memory decreases with age. It is memory that helps to form links between new and old information. Short-term memory or working memory is limited to approximately five to nine bits of new information at a time. The ability to perform chunking, or the grouping of associated concepts, is important for all learners. Association: refers to trainees being able to associate newly received information with something they already know. Similarity: when trainees receive information that is similar to information already attained, they are more likely to benefit from transference. Degree of Original Learning: this refers to amount at which the trainee was able to engage in original learning, meaning trainees participated in learning original to themselves. Critical Attribute Element: when the elements learned are extremely critical to the successful completion of the job then transference is more likely. Reinforcement: if desired behavior is reinforced, then the likelihood of transference from training to performance in increased. Action Learning: Participants work in small groups on a real project/problem and learn how to learn from that activity. Experiential Learning: A holistic learning approach in which the learner utilizes his/her experiences and learning strengths in the process of constructing knowledge. More commonly referred to as “learning by doing”. Project-based Learning: Participants work in small groups to solve a challenging, interdisciplinary problem using group chosen strategies and activities. Self-directed Learning: An informal learning process in which an individual takes on the responsibility for his/her learning process by identifying their learning needs, setting goals, finding resources, implementing strategies and evaluating their results. Multimedia resources (videos, podcasts, audio files). Having a basic understanding of the main learning theories allows you to have more strategies that can be used when designing any learning solution. Instructional designers should consider different strategies when designing learning experiences to accommodate different learning styles. By doing this, there will be a rich learning environment for learners, offering options to explore content in different ways, using a variety of methods that are going to create an engaging learning experience, and are going to motivate learners. 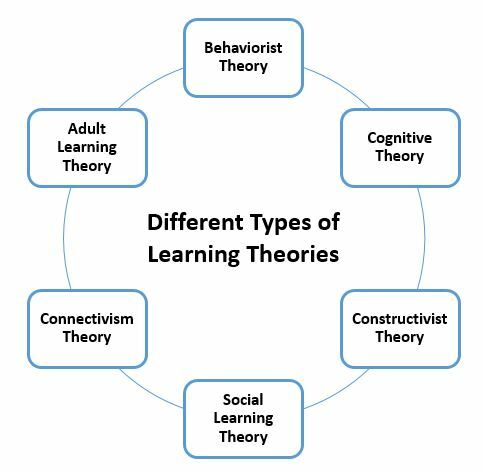 Now I would like to ask you, based on this snapshot of the different learning theories, which one is your favorite when you are a learner and which one would best suit your learners? I hope this information will be valuable to build a foundation knowledge of the different learning theories. Cercone, K. (2008). Characteristics of adult learners with implications for online learning design, AACE Journal, 16(2), 137-159. Ertmer, P. A., & Newby, T. J. (1993). Behaviorism, cognitivism, constructivism: Comparing critical features from an instructional design perspective. Performance Improvement Quarterly, 6(4), 50-71. Hinton, J. (2009). Lifelong learning: effective adult learning strategies and implementation for working professionals, The International Journal of Learning, 16(1). Wenger, E. (2009). A social theory of learning. In Illeris, K (Ed. ), Learning theorists … in their own words (1st ed., pp. 218-228). New York, NY: Routledge Taylor & Francis Group.